Contaminants can affect the performance of oils and reduce their effectiveness. Oils contaminated with either foreign liquids and/or solids can easily be recycled to their original state using Omega waste oil recycling systems such as the OVR and TORS units. Reclaim oil on site and save. Avoid down time. Oil purification can be accomplished while your equipment is in operation. 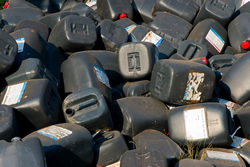 Avoid transporting contaminated material and reduce liability. Improve performance of your equipment and reduce repairs and maintenance costs.